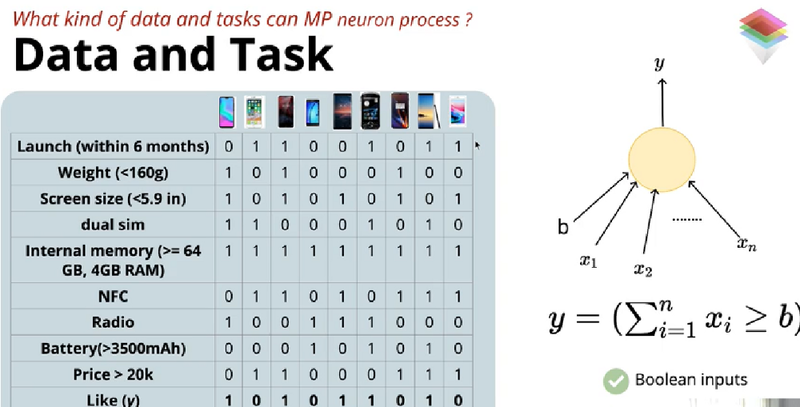 How mp neuron can process the task for certain data? the machine will read data in terms of binary if data is all Ones (aggregation of input is higher than the threshold b )output y will come as one(out), if not output as zero(not out). Here the point is how we have to define the threshold b? the threshold b we can define by our requirements ex. a launch date or memory etc..
if phone data is greater than the threshold data can be treated as one. and we can decide is the is liked or not by total aggregation of inputs is greater than the threshold .